lower than the temperature of the surrounding medium. substance exchange heat with each other. 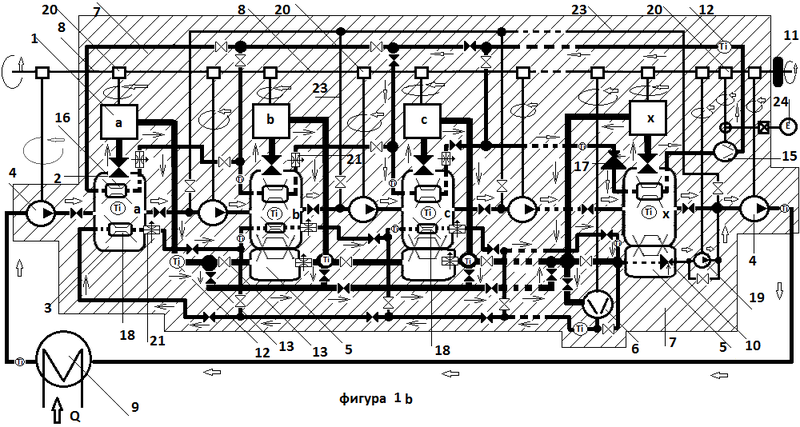 be two evaporators with two CTEME – a warm and a cold part for each device. liquid working substance having the temperature of the surrounding medium. evaporator due to the evaporation in the previous evaporator. 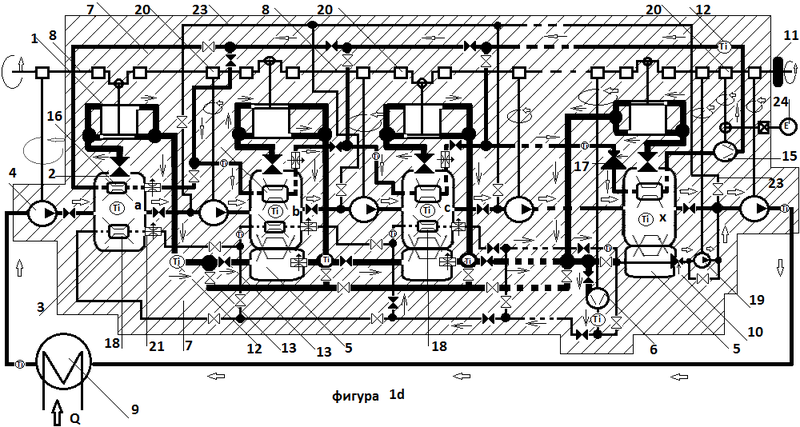 powers of all CTEME 1 will give the power of the driving shaft 8.
box 20 in such a manner that the compressor 6 is driven by the CTEME 1. Tboil is the boiling temperature of the working substance. difference in the output of the pumps being ignored. and ones with high pressure 18.
each heat exchanger 5 there is an adjustable valve 21.
temperature decreases with each further evaporator. lower than the temperature of the incoming gases. 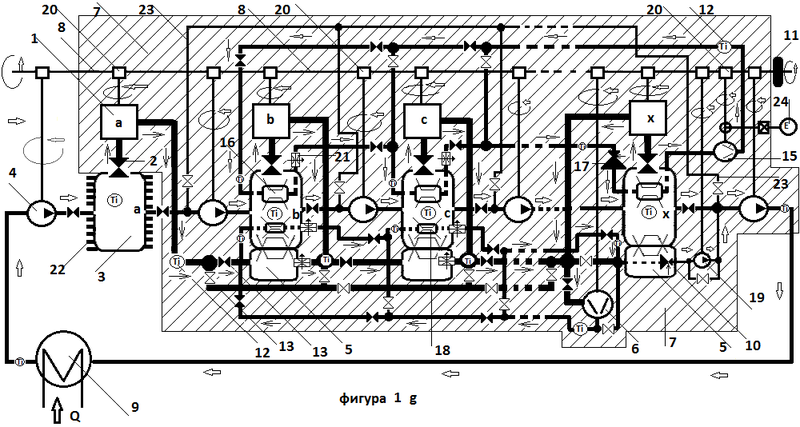 In Figure 1b the gases flow into the heat exchanger of the first evaporator (3a). the gaseous working substance passing heat to the liquid working substance. system for liquidifying of the gaseous working substance (SLGWS). 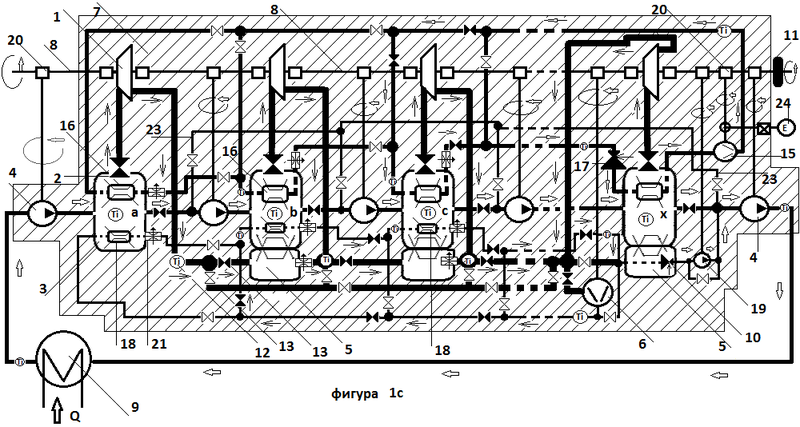 of the heat exchangers 18 (Figure 1). 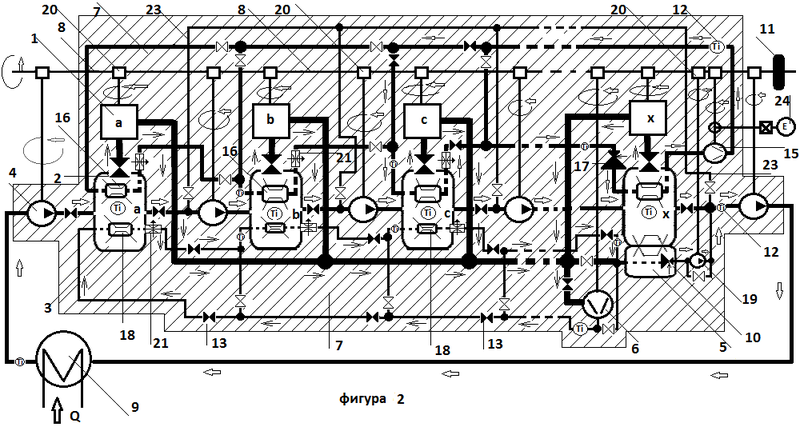 - Starting motor drive 24.
interrupt the mechanical connection of these elements with the driving shaft. the device of the invention). an adjustable expanding valve 17; closing valves 13; adjustable valves 21.
pressure of the working substance in the SHR. 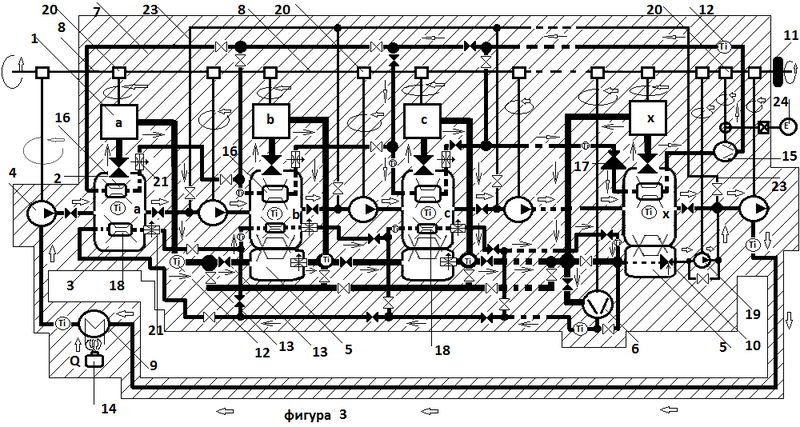 exchanger in the last evaporator x – the cold part of the device of the invention. the heat exchanger 16 into the compressor 15 and thus closing the cycle. the working substance of the device of the invention in the warm part. the warm part side. This configuration is conditional. 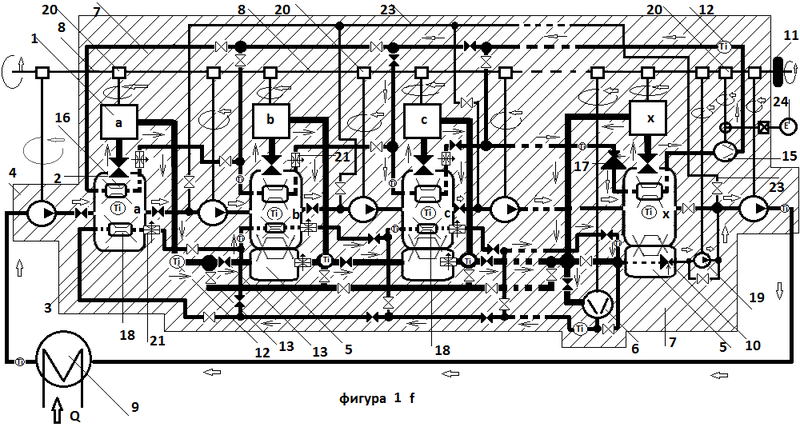 compressor 6 can be excluded from the system from its transmission box 20 (8). substance, a valve closes the flowing of the gases toward the compressor. 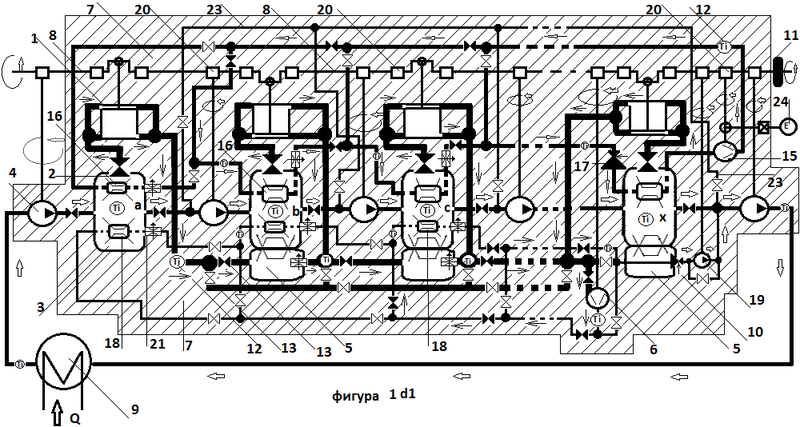 from the corresponding transmission box 20 (8) as depicted in Figure 1e. mechanical connection with the driving shaft from the corresponding box 20 (9). Texit is the temperature of the working substance at the exit. The system for heat redistribution sets the power of the device of the invention. precondition for a greater load. temperature at the exit of the device of the invention. temperature of the surrounding medium. This leads to decreasing of the power. converted into mechanical energy. Thus we neutralize the thermal losses. invention with the heat exchangers 18 being switched off. of the compressor 6 in the heat exchangers 18.
low thermo conductivity the device will be more effective. the invention to operate correctly in this operating regime. substance moved by the pump 19.
where the cycle is closed. means of the starter 24.
circulate through the heat exchanger 9.
variation of the device of the invention. exchanger and the heater are thermo insulated. pumps 4 and 19 and the output of the compressor 15 of the SHR. invention and these embodiments should be encompassed too by its scope. P.S. Naturally ammonia and refrigeration gases would be one of the best working substances for such unit, but when I wrote the patent decided that we should use harmless gases. Публикувано от Svetozar the Cold в 0:31 ч.